It should not have surprised me, then, that my mother requested a picture of my new boyfriend and me for Christmas. She loves pictures, and since she lives across the country from me, she rarely has an opportunity to take them in person. I had some pictures that included my boyfriend. They fell in four general categories: Adam standing next to me, his head ducked behind mine; Adam with his hands in front of his face; the blur of Adam’s body as he ran away; and Adam standing reluctantly unobscured, his expression implying the photographer was torturing puppies. My boyfriend tolerated cameras only as long as they did not point at his own face. Scrolling through pictures of our first vacation, I came across one that did not feature Adam in a mad dash to hide behind the nearest scenery. I’d taken the picture at the apex of our hike, when we stopped by a perfectly still mountain lake for lunch. It showed us cuddling as we ate. Yes, we were somewhat battered; I’d stepped on a branch and scratched my ankle, and we were both decorated past our ankles with dust from the dry trail. But, to me, these details enhanced the photo. It told a story: young love, a gorgeous day, and triumph over a strenuous hike. It seemed to encapsulate our budding relationship better than any other picture I had. 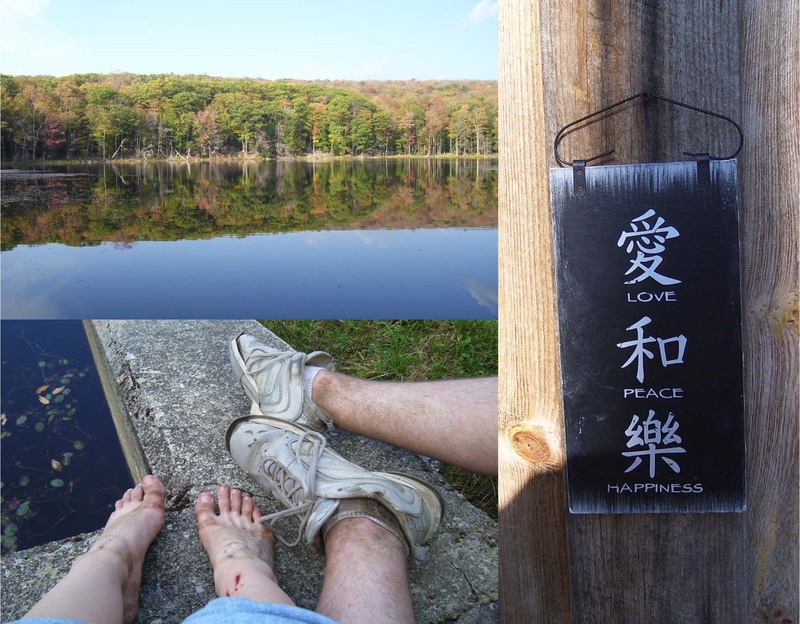 Because I wanted my mother to get the full sense of how I felt about our trip and this new guy, I combined the photo with two other pictures: one of the lake reflecting the autumn foliage, and one of a cute sign next to the door of a cabin we stayed at later in the year. For some reason, my mother was less than pleased. Six years later, she still requests that any pictures I send her of Adam and me omit our feet. I guess everyone has their little things. Giggling here…looks like your feet got the worst of the climb! Great piece Chris…I could visualize you telling this in person 🙂 Keep up the writing – you’re a step ahead the rest of us!